Stone fruit season is one of my favorite...well who am I kidding. I've probably said a million seasons are my favorites at this point. It is hard to come across good fresh peaches in the northern most state of New England at this time of year. But, I lucked out surprisingly with some from the grocery store. I thought instead of muffins, I would mix it up a bit and do a spin on breakfast treats. I pretty much tweaked the recipe from food52.com, one of my favorite foodie sites and feeds. Step 1: Preheat the oven to 375° F.
Step 2: Gently toss peaches and sugar together in a large bowl and let sit for 5 minutes. The peaches will release some juices and become syrupy. Step 3: Drain juice from peaches and reserve 1/4 cup of the juice (you can throw out any remaining juice). In a small bowl or measuring cup, whisk together the reserved peach juice, lemon juice, cornstarch, salt and cinnamon until smooth. Step 4: Mix peaches and juice mixture together in a bowl, and then transfer to the cast iron skillet (or baking dish) Set aside. Step 5: For the biscuit topping, whisk together the flour, cornmeal, sugar, baking powder and salt in a medium bowl. Step 6: Add the butter and use your fingertips to rub the butter into the dry ingredients, working quickly, until the butter pieces are about the size of lentils. Step 7: Beat the egg and the milk together and add it into the flour mixture, mixing gently until the dough comes together. If the dough seems too dry, add a splash more of milk. The less the dough is worked the better. Step 8: Using a large spoon, drop the dough over the fruit mixture, leavings space between each spoonful as the dough will expand in the oven. Press the fruit halves that you have set aside into the spoonfuls of dough, brush dough with milk and sprinkle dough and fruit with sugar. Step 9: Bake the cobbler for about 35 minutes, until the filling is bubbly and the topping is golden brown. Cool for a few minutes. This is best served warm with a scoop of greek yogurt, or if you want to indulge whipped cream or vanilla ice cream. When the weather finally gets warm and beautiful in Maine, I can't be bothered with being inside, its still so novel. My summer clock has already been set, which means I am up until midnight and awake when the sun rises. If only I actually could get out of bed with the sun, haha, my days would be much more productive. After my energy and animo have been dormant for the past 5 months, its as though a switch has been flicked back on, the drip of motivation has been increased and I feel zest for life again. Things seem okay, I don't feel the need to escape to warmer places, fictional settings, or live vicariously through the characters I grow so close to with marathons of Netflix episodes. May has been a blessing of warm and sunny weather. I've been running the Back Cove regularly again, beach combing in South Portland, and working on my hugely improved and expanded urban garden. I even just purchased my first propane grill! I've already used it three times. BBQ chicken dinner one night, grilled zucchini, Eggplant and Red and Orange peppers made amazing sandwiches for work this week, and Friday night Sockeye Salmon with Chipotle Sweet Potato Coins, ahhh! So amazing! Had my iPhone camera been working, that probably would have been the most recent post, but due to a damaged battery, leading to a replacement phone, I couldn't get more than a few seconds of usage out of it. Maybe I will have to make that my next post. So yay to the first real rainy day! Rain made my Sunday ambition inspire me to make naan to go with one of my bimonthly staples, curried lentils. Well this is my second attempt at yeast breads with the same batch of yeast in my pantry and it just didn't rise. The yeast must have been old. So that post is just going to have to wait. Monday ambition, cleaning the house for three hours! I found a new component of my vacuum cleaner, and cleaned it out. I thought the thing was shot, as it had been spitting all the dirt back out. But oh baby, that was some fine suction I got, and some super clean floors. Yeah, sometimes its really the small things. As this post has taken me a total of three days from start to finish, its Tuesday and the third day of rain. I am not feeling so good about yesterday and today's high of 48 degrees and am more disappointed to find most of the seeds that had sprouted in my garden bed drowned. Not to mention the squirrels have eaten off all the leaves of my pumpkin plants. I put a net over all my beds, but they still find their way in. After I found the last two plants chewed, I sprinkled cayenne pepper on everything. If you know how to keep those tree rats away, please leave it in my comments. If only the rainy days meant I had time to catch up on posts. I have so many posts on my Instagram account awaiting a blog post and recipe. With time, only two and a half weeks until school is out! 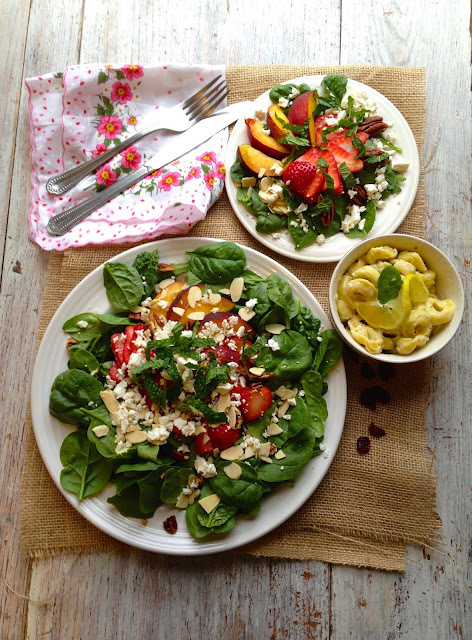 So here is to a non complicated, don't have to wait for the dough to rise, find it in the fridge recipe, a simple salad, and really, its great for this season, as strawberries and baby spinach start to fruit from the early summer ground. Place spinach in a bowl or on plate. Next place the sliced strawberries and peaches. Sprinkle the roughly crushed candied pecans or slivered almonds on top of the fruit. Sprinkle on the cheese over the nuts. Drizzle with a Tablespoon or so of EVOO, 1 teaspoon or so of maple syrup, and a drizzle of balsamic vinegar or the citrus juice. Top with the fresh mint and serve. Cracked pepper and salt optional. If you have a flavored gourmet balsamic vinegar, this would be really nice with the salad.